When I initially asked Asher and Zephan what kind of bedroom they wanted this go-round they requested a science-bug-Star-Wars-space-dinosaur-nature-animal-superhero inspired room. Woah. That is a lot of inspiration to cram into one room! I did my best and am proud to say that I think I pulled it off. Asher is our budding scientist in the family, and I knew I wanted to incorporate some type of periodic table art for him somewhere in the room. 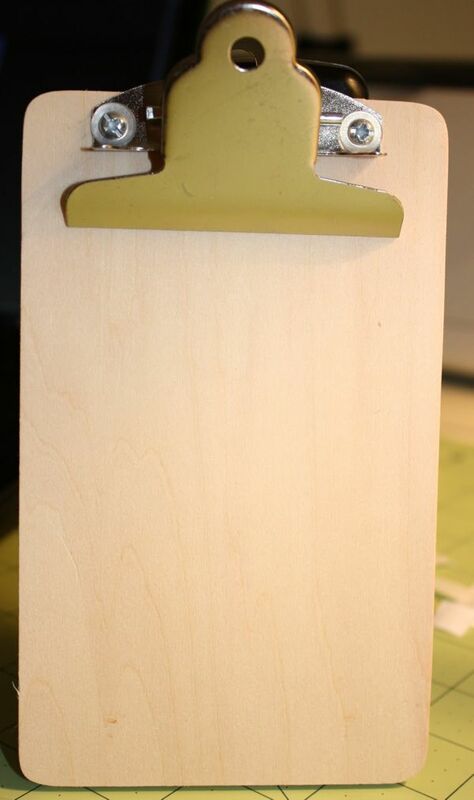 I stumbled upon these mini clipboards at A.C. Moore for $1 each and knew they’d work great for this project! 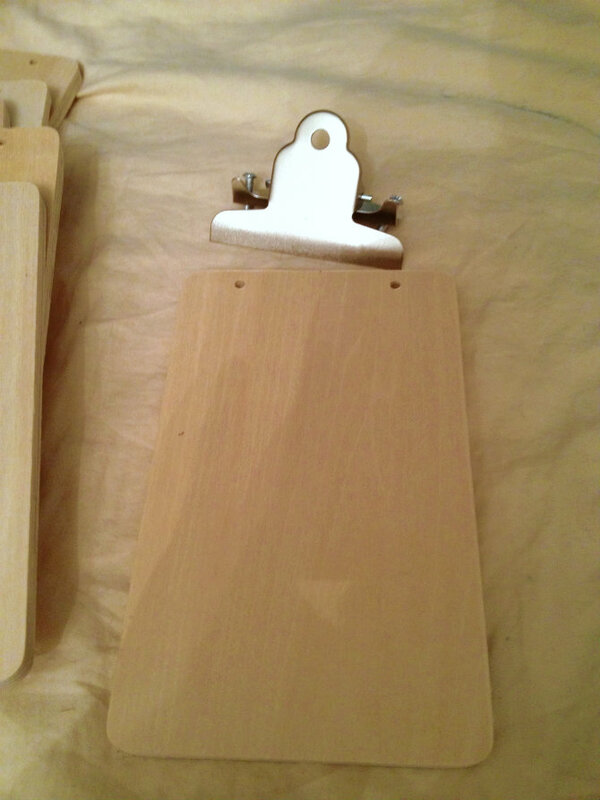 The clipboards disassemble easily with a screwdriver for painting, staining, mod-podging and what not. Just take off the hardware and get creative! 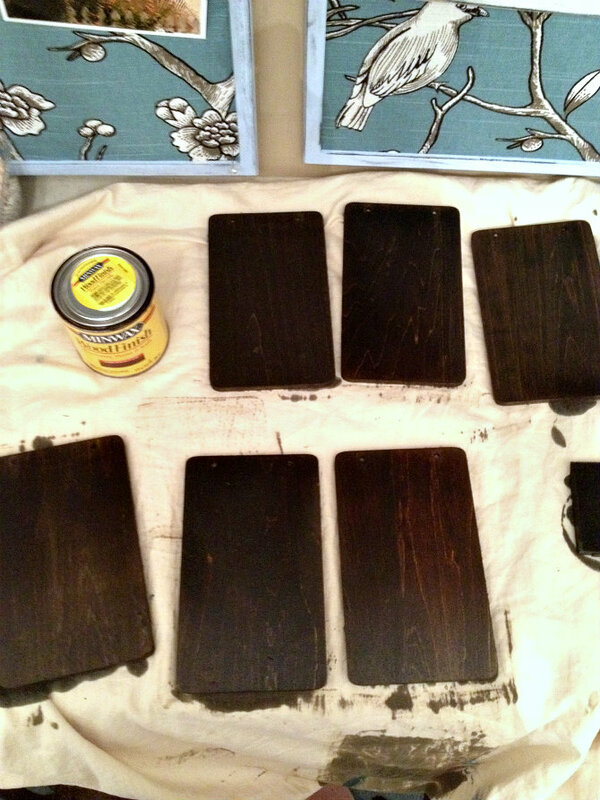 I used a foam brush to coat each clipboard with one coat of stain and let them dry overnight. 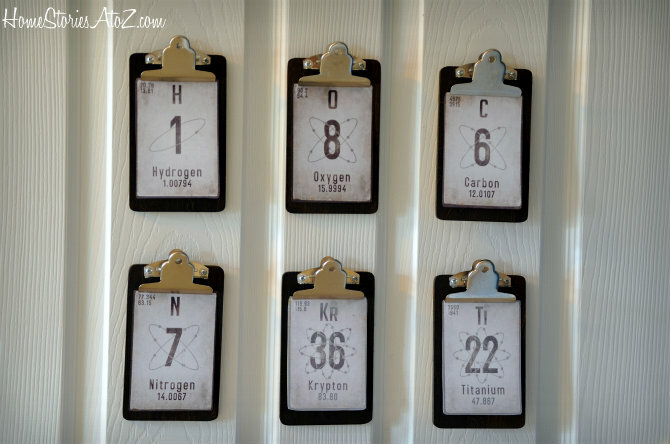 In the morning, I created and printed out (on photo paper) some periodic elements based on poster art from Restoration Hardware Baby. I put the clipboards back together, cut out my art, and hung them on the back of my kiddos’ door! 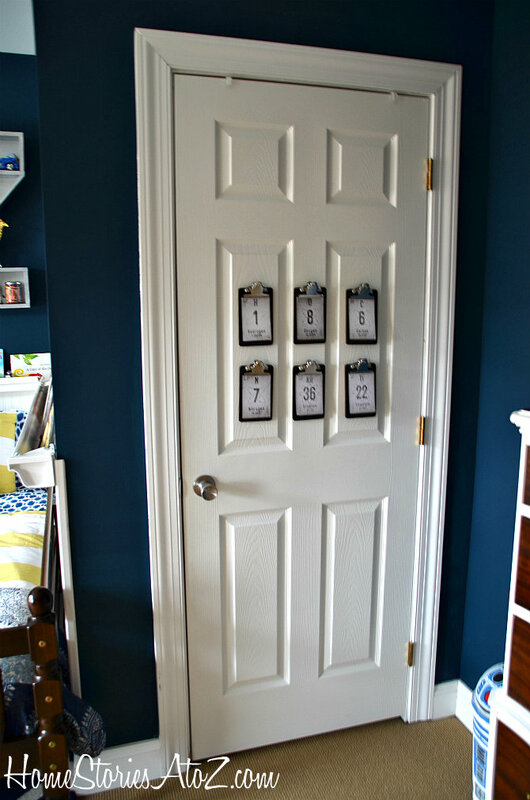 I love how the clipboards add to the theme and create a focal point on the otherwise boring door. 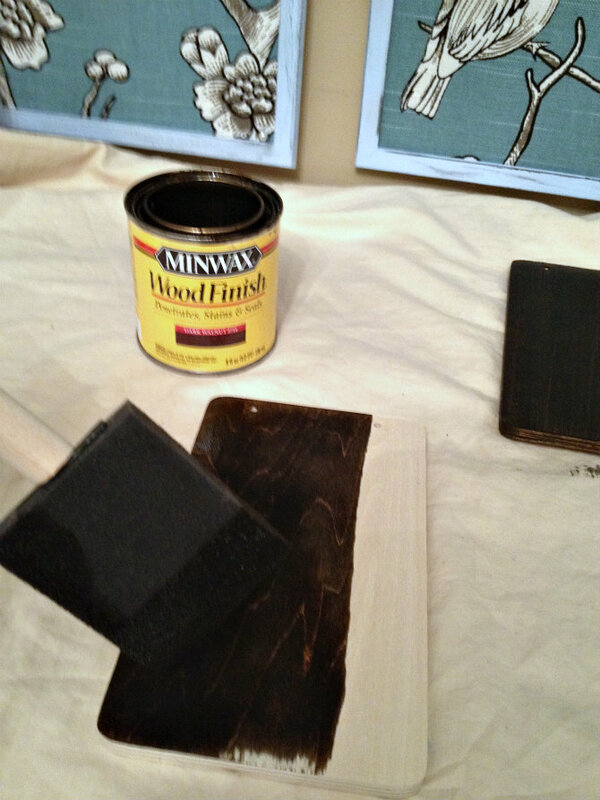 I have one more simple project/tutorial to show you in this room before the final entire room reveal so stay tuned! Just perused this site from another search and I love this idea – so creative and simple. I like how you incorporated the science with the superhero (Krypton, Titanium……..I hope I’m not the only superhero geek that caught that). Well Done!! OK, I TOTALLY want a science-bug-Star-Wars-space-dinosaur-nature-animal-superhero bedroom too! When you’re done with that one can you come to my house? Love the huge variety they pick! I totally understand though, it is hard to pick one thing, color or style. Heck, I still don’t do that 🙂 The boys room always look great. Sure they love them!! I see this becoming a very nerdy Christmas countdown calendar…anyone, anyone? No? Am I too big of a nerd? Way to make science look chic! 😉 But seriously, what a cute idea! Very cool. I never would have thought to do anything like that. Love the real creativity. Cute! My inner chemistry geek is smiling! Ha! I hated chemistry with a capital H but am thrilled that my kiddo is a science geek :). Oh yay! Thanks for visiting me Erin :)! Thank you Sheila! Asher was BORN with science as his passion. Even as a baby he loved it. If he grows up to do something else I will be supportive of course but very, very surprised :). I actually just used very tiny brads and nailed directly into the door but you could use 3M strips if you didn’t want holes in your door :).